Chicken in wine sauce. Peppery pasta salad. Salmon with dill. It seems that healthy eating has come a long way from cottage cheese and celery sticks, says Jackie Newgent, R.D., a spokesperson for the American Dietetic Association and a nutritional consultant in New York City. 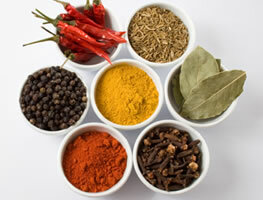 Newgent offers these tasty, low-calorie ways to spice up your eating without spoiling your diet. Get sweet on sour. Adding an acid such as wine, fruit juice, or vinegar to food can give it an intense taste boost. "It can be something as simple as adding balsamic vinegar to a raw tomato, which brings out its flavor," says Newgent. Liven up a cup of soup with a splash of dry sherry or lemon juice, or try an acid-enhanced sauce in lieu of gravy or other high-fat accompaniments. Start by sautéing onions and garlic, then adding wine, lemon, or lime juice, or even a splash of vinegar. Cook for a few minutes until some of the liquid evaporates. Then spoon it over meat, poultry, or fish for a healthy meal that would have even Julia Child smacking her lips. Sample some spices. Everyone knows that herbs and spices are a great way to enhance flavor, but many are overwhelmed by that vast array of mysterious powders in their kitchen cupboards. "What I usually suggest is that you purchase one extra spice or herb and start working with that," says Newgent. You could, for example, begin with some dried dill, which "would go with carrots, fish, potatoes, and rice." Or sprinkle cinnamon over oatmeal or rice. Also, experiment with a fresh herb such as basil. "Chop it up and sprinkle it on your pasta dishes," she advises. "It goes well with chicken, or anything tomato, and even beans and grains [such as] couscous." Perk up plain-Jane veggies. Virtuous, yes, but vegetables can be a bit boring if not prepared properly. Newgent has three tricks to keep them tasty: First of all, instead of just serving one vegetable, mix up a colorful array of vegetables, such as broccoli, peppers, and carrots. Second, "don't be afraid of butter," she says. "A lot of people think, 'If I'm eating healthier, I have to avoid it.' You want to try and get away from that good food/bad food philosophy." Just use butter judiciously, she says. "Think teaspoons, not tablespoons." Finally, add crunch and flavor to vegetables with a topping of toasted bread crumbs (which can also take the place of cheese on casseroles and lasagna), a squirt of lemon juice, or a dollop of your favorite salsa. Bon appétit! Correct. Redeeming points does not impact your Total Activity Points or overall standing. Some easy ways to alleviate the pain that comes with bike riding.